Esther Caroline Lifer age 94, of Ashland, died Wednesday August 26, 2015 at Kingston of Ashland. 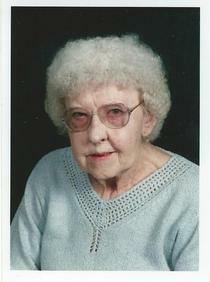 She was born March 17, 1921 in Ashland County, the daughter of Floyd and Esta May (Smith) Eagle. She was a graduate of Jeromesville High School. Mrs. Lifer had been a lifelong resident of Ashland County where she was a Homemaker. Mrs. Lifer had been an active member of the Peace Lutheran Church. On December 21, 1941 Esther married John K. Lifer who preceded her in death in 1999. Survivors include her sons, Gary (Shiroko) Lifer of Chesapeake, VA., and Richard (Deborah) Lifer of New Bern, N.C.; her 6 grandchildren; her 8 great grandchildren along with her sister, Mary Johnson of Medina. She was preceded in death by her parents; husband, John; and her daughter, Janet Drake. Funeral services will be held at the Peace Lutheran Church on Saturday September 5, 2015 at 1:00 P.M. with Rev. Karen Liddy officiating. Burial will follow at Ashland County Memorial Park. Friends may visit with the family on Friday September 4, 2015 at the Heyl Funeral Home from 6 to 8:00 P.M. The family suggests in lieu of flowers memorial contributions may be made to the Peace Lutheran Church 1360 Smith Rd. Ashland, Ohio 44805.